Every effort made by the Italian government to cut down on teens smoking has proved abortive as tens of thousands indulge on this menace daily. 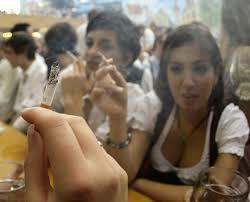 A new survey which showed Italian students smoked significantly more than their peers. In Italy, 37 percent of 14-16-year-olds said they had smoked in the past month - the highest rate of all 35 European countries surveyed, and well above the average of 21 percent. The survey by Espad (European School Survey Project on Alcohol and other Drugs) saw students from 35 European countries, with the UK and Germany not included, questioned about their use of tobacco, alcohol and drugs. Across the continent as a whole, teenage smoking was on the decline, and an average of 54 percent had never even lit a cigarette. Those who did smoke were also taking up the habit later in life, except in four countries including Italy, where the number of children starting to smoke before reaching 13 had increased over the past decade. The other three countries bucking the trend were Cyprus, France and Romania. Iceland and Norway had the lowest rates of teen smokers, with six and ten percent respectively describing themselves as 'habitual' smokers. The other area where Italians scored highly was cannabis consumption; 21 percent admitted to consuming it, a figure much higher than the average of 16 percent. However, Italy's students were only the third biggest users of the drug. The Czech Republic topped the table with a figure of 37 percent, followed by France at 31 percent. Italy introduced a set of laws aimed to curb smoking earlier this year, including more warnings on packets, and license bans for shops found to be selling cigarettes to under-18.